It is a beautiful art. Yes, it’s an art, it’s not a mere hobby. Growing bonsai trees requires attention to detail, an artistic sense and an incredible amount of patience. There is no such thing as instant gratification in bonsai. Simply put, bonsai is about growing trees in miniature form using various techniques such as pruning, wiring, special potting etc. The tree species used are not dwarf plant varieties – they are normal trees which, depending on the species, may grow hundreds of feet tall in the wild. The bonsai artist uses her or his skill to keep the tree small and compact while making sure it doesn’t die, but preserving the general look and style of a full grown tree. 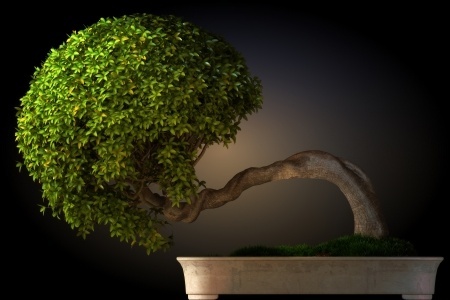 So a bonsai tree is like a small, simplified form of a “normal” tree. I say “simplified” because, since the tree is small, there are fewer details than what one may find on a full-sized plant and these details tend to be relatively larger. For example, if the bonsai tree is 100 times smaller than one in the wild, then its leaves will not be 100 times smaller, they will be only somewhat smaller than the original. It’s almost like you have a live caricature of a tree living in the wild. The art itself originated in China, from where it spread to Japan and later to the rest of the world. In general the art form is considered distinctly Japanese and is tightly associated with the Japanese culture. How to start with bonsai? As with any undertaking that requires skill, it’s good to read up on some theory before taking the plunge. In the end, however, it’s practice that matters. If you’ve never done bonsai before, it makes sense to pick a tree species that is known to be particularly forgiving towards beginners and simply start grwoing one. You will learn many things along the way. You’ll also learn to cultivate patience and a certain appreciation for detail. It’s a long, but a most rewarding journey! Which tree species to choose for bonsai? Almost any tree species and also some other plants may be grown into bonsai, though some are easier than others. 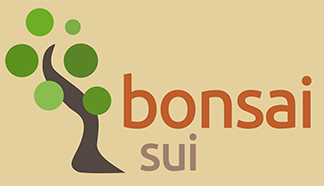 In any case, the choice is huge as there are very many different species and types of bonsai trees. Which ones you should go for depends on the visual style you want to achieve and also the amount of work you want to put in. You also need to consider the environmental conditions that you will be able to provide to your plants. The Ficus genus offers multiple candidate species for growing as bonsai. More commonly known as figs, these are evergreen plants. They are not too demanding in terms of care, and so will be suitable for newbies. With some skill and the right conditions, it’s possible to have your ficus develop aerial roots, a very interesting and aesthetically pleasing feature. Azalea belongs to the genus Rhododendron and is very popular amongst bonsai trees for its magnificent flowers, which open abundantly in spring, somewhere around May to June, and keep their flowers for many weeks to come. It belongs to the genus Rhododendron, of which Satsuki azalea and Kurume azalea are the most common. They come various colors, shapes and sizes and can basically take any form, and look unbelievable with multiple trunks. It is an evergreen tree with beautiful foliage of a dark green. Azalea bonsai flowers are so beautifully colored that you think you are looking at a true masterpiece. Chinese Elm is originally from South-East Asia and it is one of the most common and popular of the bonsai trees, as it is relatively easy to grow compared to other types, thus preferred by beginners. It is slow growing, tolerant and not very demanding. You can easily distinguish it by its small oval shaped leaves of a light and fresh green color. It develops a fine and distinctive ramification and has a dark grey to deep brown bark that becomes corky when the tree gets older. Like all bonsai trees, a Chinese elm likes sun, and just a little bit of shade. It can be kept outside even during winter, but only in moderate climate countries, where conditions are not too harsh. These semi-evergreen bonsai trees don’t like too much variation in temperature. Jade is originally from Africa and it is an evergreen tree that is fairly easy to take care of. It has a thick trunk and fleshy leaves full of water. The Jade bonsai is considered to be an indoor tree, but it can also be grown outdoors if it has a lot of warmth and sun. It usually blooms in autumn, and the flowers are beautiful, small and white. The bark is red brown at maturity and it has a dense branch structure. If it has enough sunlight, its leaves will develop red edges that will give it an interesting stylish look. Conifer trees are one of two primary types of bonsai. Trees in this division commonly have leaves in the form of needles and produce cones. Conifers are usually strong and vital. It’s interesting to note that most conifer species are suitable material for creating bonsai trees – and these are numerous, since there are over 600 species of conifers. Some of the more common coniferous bonsai trees include the spruce, the cedar, the larch, the yew and the hemlock. Cypress is often considered a good choice for beginning bonsai artists, since it, in particular the Bald Cypress, is not as demanding in terms of growth conditions as some other tree species. Note that the family of cypress trees has both deciduous trees (ones that lose their leaves in winter) a well as evergreen ones. Both offer certain aesthetic benefits and the choice will depend on what you want to achieve with your tree. Whether you’re just starting out or already have some experience with bonsai, the Juniper is definitely one of the species to have in your collection. It’s very forgiving in terms of beginner mistakes, as well as an experienced artist’s experiments, and is generally known to live well despite imperfect growing conditions. They also happen to be beautiful trees, and hence provide a most rewarding growing experience. There are a number of Juniper species to choose from, with the Chinese juniper being perhaps the best choice for a beginner. If you want to create a bonsai from something that is not quite a tree, Wisteria may be a good choice. The plant itself is related to peas and is a climbing vine – often found decorating buildings or smothering its host plants in the wild. As a bonsai, the Wisteria is known for producing gorgeous flowers, usually purple or pink. There are several varieties of the species that you may want to try your hand at. Pines are coniferous evergreen trees that have become a popular choice for bonsai practitioners. With some exceptions, they tend to grow in a vertical manner, and have needles for leaves.